#1: The ordinary age for preparation for First Sacraments is seven years. The child must also be in the second grade or older. Furthermore, a candidate must have either attended Holy Family School or the Holy Family Religious Education Program during first grade (or the year prior). #2: Preparation for First Sacraments must be done in addition to ordinary religious instruction. Children must actively attend either Catholic school, or Holy Family's Parish School of Religion classes. Parents of candidates must apply for First Rite of Reconciliation and First Eucharist for their children separately from registration for Parish School of Religion classes. #3: In order to receive First Sacraments parents and children MUST attend all required classes and meetings or attend make-up sessions. A Parent Meeting and Eucharist Workshop will take place in preparation for First Holy Communion. All students in grades 2nd-6th must receive faith formation instruction either in Holy Family Parish School of Religion weekly classes or via Catholic School attendance for two consecutive years. 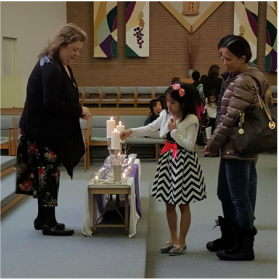 In addition to faith formation/Catholic School religion classes each student must attend a workshop to prepare to receive the sacrament.Parents of candidates for First Reconciliation must also attend the workshop and an additional parent meeting. Students enrolled in the Parish School of Religion second and third grades for the second year will obtain all necessary instruction during Wednesday evening classes. Students enrolled in the Parish School of Religion fourth through sixth grades will obtain instruction during Wednesday evening classes AND will also need to attend a series of additional instructional classes specifically on the sacrament of Reconciliation on Sundays from 9:30-10:30. Dates of these classes to be announced in November. Students in grades seventh through tenth grade must receive faith formation instruction either through Holy Family Parish Youth Ministry classes or via Catholic School attendance for two consecutive years. In addition to faith formation/Catholic School religion classes they must also attend a series of additional sacrament preparation classes on Thursday afternoons 4:30-6:00pm beginning November 19th and continuing through First Eucharist in May. Other requirements including parent meetings, workshops, and rehearsal may also be required as determined by the Youth Ministry Office. Students in Grades 7th-10th will attend Reconciliation at the Parish Lenten Reconciliation. Registration for the 2018-2019 school year will be available in November. Do I pray to God every day? Do I thank Him for being so good to me? Do I listen to Him? Do I argue with my parents when they say it is time to go to Mass on Sunday? Do I participate in Mass by paying attention, responding and singing? Do I speak about God respectfully, or do I use God’s name in vain? Do I try to learn more about my faith by learning prayers, attending religion classes and reading the Bible? Do I obey my parents like I should? Do I talk back to my parents? Am I disrespectful toward my parents? Am I responsible with my belongings? Do I clean my room and doing my assigned household jobs? Am I ever mean to my brothers and sisters? Do I fool around in class? Do I try to do my best? Am I disrespectful or inconsiderate toward teachers or classmates? Do I pick on other kids? Have I cheated on homework or a test? Am I selfish with my things, or do I share them with others? Have I lied to my parents? to my teachers? to my friends? Have I taken something that does not belong to me? Do I borrow things without returning them? Do I watch inappropriate TV programs or videos? Do I use words that shock or hurt others? Do I eat a well balanced diet? Do I get enough rest by getting to bed on time at night? Do I brush my teeth each day? Do I bathe, groom my hair, and dress modestly?